Cranberries aren't just perfect for making cranberry sauce, they are also great for baking, whether fresh, frozen, or dried. This juicy red fruit is perfect to add a natural sweetness to a variety of breads, quick breads, scones, and muffins. Cranberries (both fresh and dehydrated) are easy to find year-round, though they are most plentiful during the holiday season. Baked goods studded with cranberries can be enjoyed any time you get a craving for a delicious fruit bread. They're perfect for a quick breakfast, a fruit-filled dessert, an afternoon tea treat, and are great homemade gifts. 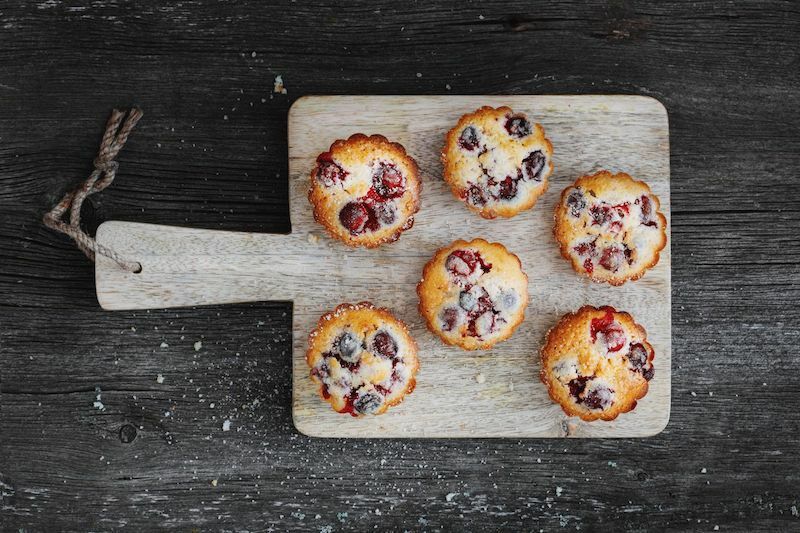 Cranberry, orange, and nuts are the perfect trio in these easy-to-make muffins, providing sweetness, tanginess, and a nice crunch. Butter is mixed into the dry ingredients, and then eggs and milk are added until a nice moist batter forms. 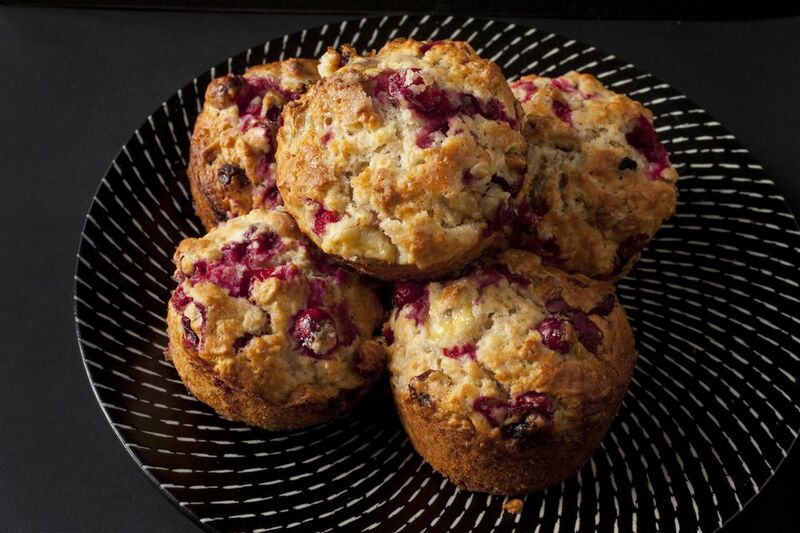 The fruit, zest, and nuts finish it off and the muffins are baked until puffed up and tender. A flavorful way to start off your morning. Scones may seem like they would be difficult to make, but this fruit-filled baked good is actually quite easy to put together. The fresh cranberries are complemented by the orange zest and the scones have a nice crunch due to the addition of walnuts or pecans. They are filled with flavor and are the ideal companion for a hot cup of tea. Just another recipe that proves cranberry and orange are meant to be together, this cranberry orange bread takes it one step further with a delicious orange icing. This is a great recipe to divide into mini loaf pans so you have a homemade gift at the ready. This bread is fantastic with the homemade icing, but if you prefer a more savory fruit bread it can be left plain. For a bit of added sweetness, dust the bread lightly with powdered sugar. Christmas traditions come to life in a classic stollen bread that should not be reserved for the holidays alone. You will enjoy making this fruit-stuffed bread as much as everyone will love to eat it. Stollens can include many different ingredients, and this particular recipe features three favorites—cranberry, almonds, and orange—which combine deliciously. This stollen is sure to add a spark to the holiday dessert table or as a sweet baked treat any time of year. Perfect for leftover turkey sandwiches, this hearty bread studded with dried cranberries and walnuts is delicious toasted. The recipe makes two loaves, one for now and one for later—or wrap one to bring to the next holiday party. This is a somewhat basic yeast bread recipe, relying on the bit of sugar to add sweetness, but feel free to add orange zest for some extra zing. The secret ingredient in this muffin recipe is the orange marmalade, bringing a nice citrus flavor without too much bitterness. Combine that with the cinnamon, nutmeg, cranberries, and walnuts, and you've got a muffin that is the perfect breakfast treat on a cold winter day. The buttermilk ensures a moist and tender baked good, so you can bake these with confidence.